This page is updated from time to time. Please select RELOAD on your browser to assure you get the latest information. The last update was made on April 13, 2018. Italiano - Annunciate le date dei giorni di apertura al pubblicio, e della dedicazione del primo tempio della Chiesa di Gesù Cristo dei Santi Degli Ulitmi Giorni in Italia. English - A free public open house is scheduled from Monday, January 28, 2019, to Saturday, February 16, 2019, excluding Sundays. A few weeks before the open house, the public can make reservations at templeopenhouse.lds.org. The temple, located in northeast Rome near the Grande Raccordo Anulare, will be formally dedicated on Sunday, March 10, 2019, through Sunday, March 17, 2019. Kent Jay Allen, and Reneé Haugh Allen, four children, Kimberly 4th Ward, Kimberly Idaho Stake: called to preside in the Italy Milan Mission, succeeding President Bruce L. Dibb and Sister Colleen Dibb. Brother Allen serves as an Area Seventy and is a former stake president, stake presidency counselor, bishop, ward Young Men president, elders quorum president and missionary in the Italy South Mission. Dentist, Pheasant Cove Dental. Born in Salmon, Idaho, to Jesse Lawrence Allen and Laura Ellen McQuade Allen. Sister Allen serves as a ward music director and is a former ward Relief Society and Young Women president, Young Women adviser, stake missionary and Sunday School teacher. Born in Rigby, Idaho, to Leon Haugh and Sara Fullmer Haugh. Michael Dean Pickerd, and Marian Wood Pickerd, three children, Biltmore Ward, Phoenix Arizona East Stake: called to preside over the Italy Rome Mission, succeeding President Michael Waddoups and Sister Anna Kay Waddoups. Brother Pickerd serves as a high councilor and is a former Area Seventy, stake president, bishop, local coordinator for the Phoenix Arizona Temple and missionary in the Italy Rome Mission. Phoenix Market Executive, JPMorgan Chase Bank. Born in Torrance, California, to Eggert Gale Pickerd and Grace Roylance Pickerd. Sister Pickerd is a former stake Young Women president, stake and ward Young Women presidency counselor, ward Relief Society president, seminary teacher, gospel doctrine teacher and missionary in the Italy Rome Mission. Born in Ottawa, Canada, to Stephen Lane Wood and Elizabeth Griffin Wood. Construction Photos of the Rome Italy Temple. The completion of this edifice is estimated to be late 2017, but no official announcement regarding its completion date has been made by the church. If you are looking for information about an upcoming mission reunion, please visit the Reunions Page. News Items no longer considered current are located here. Please note: We are largely dependant on our readers for the inclusion of information about inportant happenings (including deaths) among our missionary colleages! Please take the time to let us know about such happenings so they can be shared with others who look for news here on the web. Contact the Webmaster at the email address [ima at mhpdigital dot org] with any such new or current information to have it placed here for everyone to know about. Thank you! Details on the meeting will be reported soon. It was a wonderful experience to be a part of. Thanks to everyone who participated!! We enjoyed a meeting together with our Mission Presidents again this year. The Boyntons were not present as they are serving a mission in Florida at this time. President Jeff Acerson conducted the meeting. Speakers included returned Presidents Wolfgramm and Kelly. We heard about the emphasis on Indexing for the Italian Records Extraction Project of the Church, and heard about the making of the windows for the new temple in Rome. Elder DeFeo spoke (in Italian) about the work in Italy. Listen to the meeting at the link below. 2014 General Meeting mp3 audio. On September 15, 2013 the Church created its second stake in Rome from a portion of the original Rome Italy Stake and the Napoli Italy and Sardegna Italy Districts. The Rome Italy West Stake includes the following five wards and seven branches: The Cagliari, Caserta, Ladispoli, Roma 1st, and Roma 4th Wards and the Battipaglia, Castellammare, Flegreo, Napoli, Olbia, Oristano, and Sassari Branches. The realigned Rome Italy Stake was renamed the Rome Italy East Stake and includes the following five wards and two branches: The Pescara, Roma 2nd, Roma 3rd, Roma 6th, and Terni Wards and the L'Aquila and Roma 5th Branches. The creation of the new stake was primarily made possible due to strong active membership and congregational growth within the original Rome Italy Stake (organized in 2005). The Roma 6th Ward, for example, was created from the Roma 3rd Ward; a ward that split just last year to form the Roma 5th Branch. It is likely that additional branches in both stakes will mature into wards within the foreseeable future. There are now nine stakes and three districts in Italy. This year's reunion was in a different location but was well-attended. The meeting was conducted by Pres. Rod Boynton and the opening prayer was by Sister Kim Acerson, recently-returned from her mission. Speakers included returned Presidents Acerson, Dunaway, and Toronto, and Elder Gessati spoke about the work in Italy. The reunion was held in Salt Lake City, Utah and was conducted by President Robert Rhein who is speaking at the beginning of the recording. Below is a link to the recorded proceedings of the opening portion of the reunion meeting. Shortly single files, one of each talk, will be added for each of the participants. Speakers included President Wolfgramm and Elder Gessati. Enjoy! The Rome Temple Groundbreaking has taken place! The Church has broken ground for the new temple near Rome! The ceremonies took place on Saturday Oct. 23 at the temple location at Via SetteBagni 376, Roma. Click here to see a news story about the actual groundbreaking that took place today. Clicka quì per vedere un rapporto di quest' avvenimento importante. New Mission Presidents have arrived. Benvenuti! We thank Ryan Kelly for providing this information to us. David Rudolph Wolfgramm, 59, and Sue Gardiner Wolfgramm, five children, Elk Hollow Ward, North Salt Lake Utah Stake. Brother Wolfgramm is a teacher at the Wasatch Branch youth correctional and foster care facilities, and a former stake president, bishop, ward missionary, gospel essentials teacher, and missionary in the Italy South Mission. Chief financial officer, The Ivory Companies. Born in Salt Lake City, Utah, to Rudolph Herbert and Edna Wiberg Pugsley Wolfgramm. Sister Wolfgramm is a teacher at the Wasatch Branch youth correctional and foster care facilities and is a former stake Young Women president, ward Relief Society president, ward enrichment leader, ward missionary and gospel essentials teacher. Born in Salt Lake City, Utah, to Harold Birk and Erma Young Gardiner. Thomas Eugene Kelly, 57, and Kathleen Fisher Kelly, five children, Italy Rome Mission; Cottonwood 13th Ward, Salt Lake Cottonwood Stake. Brother Kelly is a former stake president and counselor, bishop and missionary in the Italy North Mission. Former executive vice president and general counsel, JetBlue Airways. Born in Salt Lake City, Utah, to Eugene Lyle and Carol Crockett Kelly. Sister Kelly is a former stake and ward Young Women president, ward Relief Society president, counselor in a ward Young Women presidency, ward choir pianist and Church History Museum docent. Born in Salt Lake City, Utah, to Grant J. and Alta Smith Fisher. Carissimi fratelli e sorelle Vi invitiamo con gioia alla conferenza per la costituzione del Palo di Palermo che si terrà a Palermo nel centro congressi del San Paolo Palace Hotel, Via Messina Marine, 91 il 27 Giugno 2010 alle ore 11,00. Sabato pomeriggio, nel centro congressi dell'Università di Enna, Via S. Ingrà, 2 siete invitati alla sessione degli adulti delle ore 18,00. Ci auguriamo di essere assieme a voi per assaporare la storica gioia della costituzione del settimo Palo d'Italia ed il primo della nostra amata Sicilia. Presidente Nudo, Distretto di Palermo. Raccomandato: l'hotel Villa D'amato in quanto è più vicino al San Paolo Palace Hotel ed anche ai locali della Cappella di Palermo 2. Se avrete bisogno di ulteriori delucidazioni potete contattare la sorella MariaGrazia Mannino al 0039-3771326385. Here is some information about our mission for all interested. . . . President Toronto sent this to the missionaries this morning. Buon giorno a tutti voi, carissimi miei colleghi nel servizio del Signore, It was wonderful to be with all of you together with Elder Causse and Elder Gessati for zone conference. We felt an outpouring of the Spirit, and cherished the feelings of unity, love, and testimony that are always the fruits of that Spirit. Following are some instructions and information to help guide the work during this transfer and answer a few of your questions. The Church is growing in Italy! No unhallowed hand can stop the work from progressing! Zion is being established in this part of the Lord's vineyard! It is through missions and missionary work that the Lord establishes and sustains stakes of Zion. As the number of stakes increases, the need for missions decreases. More faithful, mature, self-sufficient members require fewer and fewer full-time missionaries to assist in building the Lord's kingdom. We see this pattern here in Italy with the formation of one mission in 1965, a division into two missions in 1971 (Milano and Roma), and later creation of a third in Catania and a fourth in Padova. As stakes have continued to be formed, the number of missions decreased back to three, and now, with six stakes in Italy, the building of a temple in Rome, and the formation of a seventh stake (we hope!) 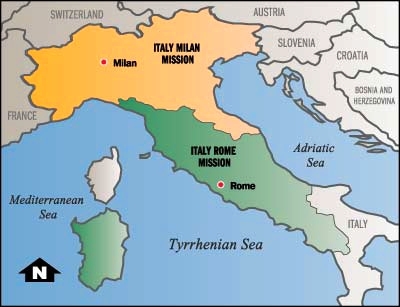 in the near future in Sicily, the First Presidency has decided to consolidate the missionary work in Italy into two missions, Italy Milan and Italy Rome. It is an exciting time to be a missionary in Italy! To be a part of bringing to pass the fulfillment of prophecy is a tremendous honor and blessing! As I said in my SMS to you all on Sunday, our Catania mission and all missionaries will become part of the Italy Rome mission effective July 1st. Your day-to-day work of bringing souls to Christ using PMG will not be greatly affected by this change, other than you will suddenly have twice as many wonderful missionaries to serve with (120 missionaries, instead of 60) and many more exciting cities, including Roma and Napoli and Castellamare di Stabia and Sassari, that you might have the privilege of serving in at some point later in your mission. I think you will also see a realignment of zones to make them larger and more effective in the work. The new president will of course decide what changes need to be made. However, I expect that, for a few months after the unification of the two missions, most of the former Catania missionaries will continue to serve in the cities and among the people that they came to know and love in Puglia, Calabria, Sicily, and Malta. It is a little sad to see the closure of the Catania mission after 35 years of service involving thousands of missionaries, but it is also gratifying to witness the hand of the Lord working to guide His servants and bring about His purposes in this marvelous land. The most important principle to keep in mind is that we all serve the Savior, Jesus Christ, and it doesn't really matter where we serve or what our mission boundaries and name are: we give our best effort always because we love the Lord and we love the people He has entrusted to us the people of Italy. I love each one of you, and pray for you every day. You are a great strength and inspiration to me. May you feel joy as you serve the Lord, proclaiming our Father's story of love far and wide. President Acerson went to a meeting in Milan on Sunday where it was announced that the Catania Mission is being dissolved. The Rome Mission will take in all of the Catania Mission and the Milan Mission will take all of Tuscany (Siena, Firenze, Prato, Pistoia, Pisa, Livorno, and La Spezia). The Rome Mission will also keep Sardegna. The change will take effect on July 1st of this year when all the mission presidents change over. Watch the Church News on February 13th for all the official announcements, including the new mission presidents! We love and miss you all and hope all is well. On another note, we are on track for 30 baptisms this transfer as a mission. We could use all your prayers. Friday October 2, 2009, 4:00 p.m. to 7:00 p.m. Exchange Park Provo, Utah 900 N. 700 W.
Please bring your own food if you wish to eat. ( it is difficult to know how many will come and what or how much people want to eat). We will have water and lemonade there. We are happy to have you bring footballs, or Frisbees etc. We look forward very much to seeing all of you and, for you to have the opportunity to visit with each other. Around 7:30 p.m. we will go over to the Wilkinson Center Room 2142 (one of the Ballrooms) until 10:00 p.m. Please dress appropriately for that location. In order to not have to deal with compliance of new Utah County Health Regulations on food distribution, we will not have refreshments here so, hit "31 Flavors" on your way. If weather does not permit us to go to the park, we will be at the Wilkinson Center from 5:00 until 10:00 p,m,. If you know of any visiting Italians, or perhaps ones living in the area, please invite them. We would love to see them as well. Anna Fazio of Bari passed away Saturday October 20, 2007 in Bari with her family around her. She was a valiant member of the church and a strong proponent of the missionary spirit among her people. She will be greatly missed. She is to be interred next to her husband, Francesco Fazio, in the Provo, Utah Cemetery (about 900 South at 900 East). A graveside service will be held there on Saturday October 27 at 11am near the southeast corner of the cemetery. You are welcome to call Mike at 801-376-2531 for information. Friends are invited to attend. A get-together afterwards at a local church is planned. Details will be posted when available. Ho ricevuto un e-mail da mio figlio (Anziano Lofgreen) che e` a Roma e ci ha chiesto se potessimo digiunare con i membri in Italia il 18 marzo perche` il Vaticano dia la possibilita` alla nostra Chiesa di fabbricare il Tempio li` a Roma . Tutte le pratiche religiose vanno attraverso il Vaticano e cosi` ci vuole un po` piu` di "spinta" per fare avverare questo nostro "SOGNO".... Hanno gia` 14 acre di terreno e sembra che le cose vadano avanti, se sono gia` in contatto con il Vaticano per il permesso. Non so altro. So solo che preghiere e digiuni vengono ascoltati dal Padre Celeste se e` il tempo giusto. Ciao a tutti. Report of the Italian Missions Reunion, March 31, 2006. (743 kb) Opening Hymn, "O Speranza d'Israele"
Presiding: Elder LeGrand Curtis, former Italy Padova Mission President. Elder Luigi Peloni, Area Authority Seventy and Dr. Giovanni Maschero, Italian Vice Consul also in Attendance. Pres. Henderson recently returned and was gong to take over as Association President, but he was elected Mayor in his home town and is busy for the present. He has received a temporary "deferment" from this assignment, and Pres. Daniel Jensen, recently returned the Italy Rome Mission has consented to serve as Chairman of the Italian Missionary Association for the next two years. Financial Report- Contributions are accepted but are no longer sought at this meeting. Refreshments were donated last year, so no expenditures from existing funds have been made since last year. We are in good financial shape. This year we celebrate the 40th anniversary of the establishment of missionary work in Italy. After the General meeting we will break out for groups to allow you to visit with your Presidents and missionary colleagues. A number of speakers will be presenting talks on subjects of historical interest here in the chapel during this time, in celebration of the 40th anniversary. We invite all who have interest to return to the chapel or remain here for these presentations. Praying for a temple in Italy is a good idea. Praying for the church in general with Italy in mind is also a good idea! The church is recognized as a legal entity in Italy, but not as an actual 'religion'. Please remember this in your prayers. "Heaven is just as close to us here as it is to any other part of the world." A video presentation will take place during the visiting in the cultural hall regarding the recent organization of the Rome Stake for those who are interested. Speaker - Mark Benson, discussing the experience of the dedication of the land of Italy with his father, President Ezra Taft Benson. ROME, ITALY. Saturday, March 5th in the LDS chapel located in via Bra, was held a training meeting for the 4 Districts (Florence, Rome, Naples and Sardinia.) of the Rome Italy Mission. The meeting was presided by Elder Harold G. Hillam, Europe West Area President, and conducted by Elder Luigi S. Peloni, Area Authority Seventy. Addressing the audience, Elder Peloni said that they had been authorized by the First Presidency of the Church to announce "the birth" and organization of The Rome Stake which will take place on May 21st and 22nd, 2005, and will be presided by Elder Russel M. Nelson of the Quorum of the Twelve. This information was furnished by our friends at Bella Sion. All are invited to visit and subscribe to their free newsletter at http://www.bellasion.org/texts/NewsletterEn.html. We thank them for it! Report of the Italian Missions Reunion, April 1, 2005. Written commentary will be available here sooner or later. I felt it was of paramount importance to FINALLY get these files up here. Report of the Italian Missions Reunion, April 4, 2003. President LeGrand Curtis is conducting this meeting. Minutes written in text form may come at a later date but may not depending on time. Enjoy listening to these inspired recently- returned mission presidents, and their news about the Branches and Districts, and the Wards and Stakes of the Church in Italy. ENJOY! This image from the Church News shows the announced realignment boundaries of the missions in Northern Italy. Report of the Italian Missions Reunion, March 31, 2000. The annual reuion was held on Friday, March 31, 2000. Pres. Andersen conducted the meeting and welcomed everyone. He introduced his wife, Claudia Andersen, with whom he served in Padova as President. Also in attendance and introduced to the congregation were Pres. and Sister Dibble (Padova), Pres. Euvrard (Milano), Pres. and Sister Williams (Rome), Pres. and Sister Turner (Catania), Pres. and Sister Gillespie (Roma), Pres. and Sister Flosi (Rome), Pres. and Sister Favero (Rome), Pres. and Sister Parker (Roma), Pres. Radman (Milano), Pres. and sister Lombardo (Milano), and Pres. and Sister Cardon (Roma) and their two sons, Paul and Russell. The opening hymn was No. 156, "Chimati a Servirlo" with David Arnold (Great Italian Mission) directing and Mike Hendriksen (Italy South Mission) accopanying on the organ. The invocation was given by Sister Cardon. A report was made on the financial status of the Italian Missionary Association ["IMA"]. The current balance is $19,922, which funds are earmarked for missionary work in Italy. An invitation was extended for small donations of $5 to add to the balance of this fund. We were encouraged to visit the Italian Missionary Association Website and register there so others can find you. You will also receive Email notification of events taking place in connection with the IMA if you are registered. We were also encouraged to subscribe to the Italian version of The Ensign ("Liahona") to be in touch with what is taking place in Italy. The annual subscription rate is $10 for twelve issues per year. It was announced that President Cleve Dibble is to be the new President of the IMA, effective after this reunion. He was elected to this office by the Board of Mission Presidents. President Sowell (Milano): 160 missionaries are now serving. No changes in number of branches or wards in the mission, and no new cities opened or closed in the past year. There were 112 baptisms in 1999, and already 18 baptisms this year so far. President Curtis (Padova): 155 missionaries serving currently. During the last year new branches organized in Pesaro, Montfalcone, and in Imola, where they had their first baptism just last month. There were 188 baptisms in the Padova mission in 1999. President Pacini (Roma): There are 160 missionaries serving, of which 30 are sisters. No new branches organized in 1999. Spoleto and Civitavecchia were closed to bring more missionaries into the Roma area and concentrate them there. There were 82 baptisms in the mission in 1999. Elder John Carmack presided at the District Conference in Pescara last year, the first time a General Authority has done so. President Rempel (Catania): 135 missionaries, 15 sisters, 1 missionary couple. The Ramo Internazionale di Palermo closed this year. La Mezia was opened to missionary work, and Monopoli and Tranni were closed last year. There were 99 baptisms in the mission in 1999. Comments by Sister Flosi: What a marvelous bond we share as members of the church and missionaries in Italy. We will have this bond forever. As we recently visited the Jospeh Smith Memorial Building and witnessed the new film, "Testaments", I was touched to have had the privelege to share the Gospel of Jesus Christ as did the Three Nephites. All that we have done and all that we continue to do to build up the kingdom of God is the most righteous and sacred thing we can do on this earth. Comments by President Flosi: I stand before you with with mixed emotions. I will not bore everyone about Italy Rome stuff, but there is one subject I can talk about that everyone will be interested in. I was privileged to live in Italy from 1980-1988, and worked with four different mission presidents, including Coletti and Gillespie. In about May or June of 1980 the first stake in Italy was formed in Milano. We went up there with a lot of others from Italy to participate. Pres. Benson organized the first stake of Italy. We returned to Rome, and I was working at the American Embassy. I got a call from Pres. Coletti from the airport, and was asked to come to the airport to speak with Pres. Benson. I made it to the airport in record time and met with Pres. Benson and Elder Haycock. He said, Pres. Flosi, the brethren want to build a temple in Rome. We want you to look for a piece of property for a temple site in Rome. I was wondering, why are you telling me this, and was told that I was staying here and the mission president is leaving. I discussed this with other subsequent mission presidents. When I arrived as a new president myself, I wrote a letter to Elder Uchtdorf and asked for permission to purchase a parcel for this purpose. I was subsequently directed to look for a "big piece of land". We began the search in November 1996. I left in July of 1999, and on the eve of our departure we were supposed to have a closure on a 10-acre plot of ground just off of the beltway. This would be a wonderful plot for a stake center, and maybe for something more significant. Pres. Pacini closed that transaction a few weeks after I left the country. We now own a 10-acre piece of property near the A- 1 expressway from Milano, Florence, etc. that will be easily accessible to all of Italy. I am convinced that as soon as we get a fifth stake in Italy that serious consideration will be made for a temple in Italy. Some of you have been there at the Swiss Temple during the Italian sessions, and a warm and loving spirit is there at that time. During the sesquicentennial many unprecedented events took place. We had a celebration that members from throughout the country took part in. There was a caravan in Rome down Flori Imperiale with covered wagons and horses, and members of the church from thoughout Italy following behind. The roads were closed for us. The Tabernacle Choir came and performed in Italy last year. We now have an 80 percent retention rate of new members! The church is moving forward, largely because of your good work. People baptized by you many years ago are now sending their children on missions. We set apart 49 native members of the chuch in Italy as missionaries from the Rome Mission during our three years there. Forty-nine! That's marvelous! Pres. Anderson from the Area Presidency told us that we are still a pioneer church in Italy because we are in our first fifty years there. The church in Italy is growing at about the same rate as the church was growing in the US when it had been established for the same short period of time. I know that God lives and Jesus is the Christ. The Italian people are really starving for the gospel. The time you spent there was time well-spent. Keep in touch with the people you baptized, help them to stay firm in their beliefs. It is an honor for me to stand before you; above all, the Elders. You have taken me back many years to the time when the missionaries first knocked on my door. Please permit me to speak in Italian because my English is about zero for now. I will do my best. It has been truly a wonderful opportunity to meet again the Elders from thirty-three years ago. Saying this will reveal to you their age, but I tell you because there have been many elder I have known who have returned to Italy as Mission Presidents. It is a great honor to know these persons. I will tell you a little of the conversion of my family when the Elders came knocking at my door, the first contact we had with the missionaries. We hardly knew anything of the Mormon Church. We knew that the Mormons existed in cowboy films, but we didn't know anything else about the church or the people. I remember coming home from work one evening in 1966, and finding the missionaries knocking on our door. From then begins our conversion to the church. They came in the afternoon, and we found out later that they were from the Swiss Mission, so there wasn't a mission in Italy at the time. The first question was, as I have told you, whether we knew who the Mormons were. We said that we knew that they were in cowboy films. They then asked what we knew of Jesus Christ. We were almost offended, because we thought we knew almost everything about Him. We were embarassed later to find that we really knew very little about Him. They asked at the end of our short visit if they could return the next day and teach us one of the discussions. We made the appointment for that afternoon at 4, but we decided that we would be certain not to be at home at that time to avoid seeing them. We returned at 8, and to our surprise there were the two elders waiting at the door for us. They had been waiting for us for four hours! Their patience and constancy were apparent, and touched us. We invited them in, and we had a conversation about the Mormon Church, and the life or Jesus Christ. We came to the realization that we really didn't know much about Him. After this first discussion with the Elders began our relationship with the church. It wasn't long before my wife decided to be baptized. At that time I found myself having to deal with the problems of smoking. It was after a few months that I overcame that obstacle and I was also baptized. These two Elders who taught us showed us many imporant things, espcially the Elder who baptized my wife. Thirty years later he appeared at the chapel in Pisa, having been sent there by his employer. We hadn't heard anything from him in all this time. When we met him he said, I came here with the hope that I would find the Tolaini family still active in the church. He told us that he had written about us in his diary. These were his words: "The Tolaini family of Pisa, with their baptism have shown that it is time to open the first mission in Italy. In fact, the first mission in Italy was opened in the city of Firenze. Two missionaries before us came from Switzerland to teach the people of Italy and see whether they were ready for the restored gosepl. They found very few people that were truly interested. (They wrote down the addresses of the homes they visited, including the address of the house that would later become our home.) Unfortulately, no one was ready to accept the gospel or to be baptized, so the president of the Swiss Mission called them back, and for a while Italy was without missionaries. Then in October 1966 my companion and I arrived in Italy. Using the tracting book from the other missionaries we found the families they visited before. They stopped at the home where a family had shown some interest before, but the name was wrong. They found our name instead. They spoke with us and felt in their hearts that we would accept the gospel. In time the missionaries said that their mission president called and spoke with thm, telling them that they would soon have to return to Swizterland because there were no good prospects for converts to the restored gospel in Italy. The elder said, "The spirit suggested that we ask for a few more days in Italy. The time was granted, and we were told that if they had not found anyone ready to accept the gospel, we would have had to return to Switzerland." My family and I were the persons that the Elders found. This elder, Elder Ricks Douglas returned to Pisa in 1996 to visit, and as you know, that Pisa was the first city to have its own chapel. When this Elder saw the chapel he was moved to tears, and said, smiling, "all this is here in 1996 because that day long ago you heard the voice of the spirit, and you responded." I told him, "You waited for us for 4 hours. This was no small thing." As you have seen our conversion was a special one, because through this the fist mission was opened in Italy. Today there are many members, many missions. Thanks to the work of these former Elders, now mission presidents, that had truly planted many seeds. I am very grateful to have the opportunity to have my knowledge of the church. We know well how important it is to have this knowledge to live day to day, trying to strengthen each other to live the gospel. I am grateful for the work that was done before, and for the work that is being done now. The church in Italy will experience much growth in the future. I have lived in Bountiful for three years now. I am happy to be here. My family and I are enjoying many blessings, and the windows of heaven have been opened to us with blessings. My wife and I are currently serving a mission at Temple Square. We have great opportunities there. To conclude, I would like to read three lines that former President Lombardo of the Milano mission gave during the dedicatory prayer for the chapel of Torino. He said, O Father, wouldst thou give us the guidance of Thy spirit while we are meeting here today. We recognize the gift of the Holy Ghost that guides us in the direction of Thy eternal truths and the fact that accepeting and following the truths, and purifying and perfecting our lives, we can become worthy to stand without spot before Thee at the last day." These words have been in my heart and I am grateful to him for sharing these words with me. I leave you my testimony with you that I know that the church is true, as each of you know that we have the truth. If we will work to keep the commandments, we are secure; we have the certain promise that God has given us that in one day we will find ourselves in His presence. We will have the opportunity to have the blessings He has promised us. I leave you this testimony in the name of Jesus Christ, Amen. The closing hymn was "Genti Guardate" and the closing prayer was given by Sister Williams. Report of the Italian Missions Reunion, April 2, 1999. The reunion was held at 7:00pm on April 2, 1999, at the chapel located at 680 East 2nd Avenue (100 N.) in Salt Lake City. President Anderson conducted the meeting and welcomed all the former missionaries and mission presidents. Mike Hendriksen was the organist and Flavia Accetta was the music director. The opening hymn was "Genti Guardate", and the invocation was offered by Sister Dibble, who had recently returned from the Italy Padova Mission. President Anderson discussed La Stella and the information contained in it. He encouraged everyone to get an abbonamento. He announced that the association now has $18,410 in its account. He also encouraged everyone who is able to contribute $5.00 per year to the IMA's account which was set up to support the missions in Italy. He also asked everyone who has an e- mail address to send it to the association as it is much less expensive to communicate through this medium. The Italian Missionary Association now has a web site which is www.italymissions.com. Much mission information, including the minutes of the reunions, is now there. All future announcements will be sent through e-mail and posted on the web site. President Anderson mentioned that a sponsor was needed for Manuele Antonacci of Parma who has been serving as a missionary in Greece. He would like to attend BYU and needs a sponsor. If you are interested, contact Barret Clay at 1-520-296-3241. President Gambarotto was asked to speak and stated (in Italian), "I do not speak Italian, I speak Spanish and English." Because he was born in Italy in Veneto near Venezia, people assumed he spoke Italian. When he served in Catania, the members had charity for the missionaries but not for the mission president, so he studied the language. He and his wife are converts to the Church and were converted with their hearts. He bore testimony of Jesus Christ. He stated that it is impossible to serve without developing a great love for the people one serves. His pay for his service in Italy is his love of the people that will remain forever. He expressed his gratitude for his membership in the Church because it is a church of love. He also expressed gratitude for the opportunity of working with such wonderful missionaries. He reminded those in attendance that there will be trials, but he challenged all to remain faithful since there is no hope outside the Church. President Dibble, who recently returned from serving in the Padova mission, also spoke. He expressed his thankfulness for the privilege of working with the Castellanis. He found them to be most Christ-like. He loves them and is grateful for their influence on him and others. He said that there are now about 700 missionaries in Italy. There are also three stakes, located in Milano, Padova, and Puglia. Verona is approaching the time when it can become a stake as it has two wards and tremendous leadership. Torino and Rome are also close to becoming stakes. Firenze and Sicily could become stakes within the next five years. There is a great growth of priesthood leadership all over Italy. There are now telecommunication conferences with the area presidency, the stake and district presidents, and the mission presidents. President Dibble said it is wonderful to feel the spirit of those great leaders. The work of the Lord is going well. There are now 38 family history centers throughout Italy. Brother and Sister Amada from Pordenone served as a missionary couple to set up these centers. President Larcher is the director of family history in all of Italy. President Dibble said that there is a shifting of responsibility from the mission presidents to the stake presidents, who are taking over more of the interviewing, helping to find missionary housing, and sustaining the work in general. The Lord is hastening His work by better preparing the young people in their missionary preparation. Elder Gene R. Cook has done much to enhance the missionary work in the Europe Area. He has instructed the mission leaders on ways to reach the people and to get the father to pray on the first discussion. When the father kneels and prays, he is often touched by the Spirit which then leads to more second discussions and baptisms. President Dibble also spoke of the power of the Book of Mormon. He said he asked his missionaries to give out seven books per month. As a result, they were continually running out of books, and he requested that all former missonaries contribute to the Book of Mormon fund. He said that one of the great needs in Italy is for senior couples. He stated that Elder Haight has asked all returned missionaries to keep their language alive, and Lord will use you in ways you know not. He said that the saints have also been promised that there will eventually be a temple in Italy. He asked that we all unite our faith and prayers for the work to continue to progress in Italy. President Craig Pacini was asked to speak. He was recently called to serve as mission president in Rome. He served his first mission to Italy in 1972. He is now married and has seven children, five of whom will be going with him to Italy. The other two are serving missions in Paris and in Mexico City. For the last twenty-one years, he has worked for the Church in the human resources area. He said that he feels the time of the harvest is upon us and that we need to do all that we can to encourage the work in Italy. He rejoiced in the progress of the Church there and asked that we join the Italian saints with our faith and prayers. President Terrence Rempel was invited to speak and said that the last time he had seen this many Italians together was in a supermarket in Italy. He has been called to serve as president of the Catania mission to replace President Ascione. He served his first mission to Italy in 1969-71. He is married and the father of six children, three of whom will accompany him and his wife to Catania. He mentioned that he is a convert to the Church because an inactive aunt referred the missionaries to him. He said the greatest experiences and satisfaction come through missionary labors. He baptized a friend after his mission, and that friend is now a strong member of the Church who has sent two sons on missions. He expressed his love for the Italian people. When he was a missionary, there were 1,000 members, and now there are over 18,000. He said that the spirit of the Lord will touch us and help us to do that of which we are capable. The closing hymn was "Chiamati a Servirlo" and the benediction was then offerred by Sister Parker. This year's reunion was held at 7:00 p.m. on April 3,1998, at the chapel located at 680 East 2nd Avenue (100 N) in Salt Lake City. President Favero conducted the meeting and welcomed all the former missionaries and mission presidents. The opening hymn was Genti Guardate and the invocation was offered by Sister Jackson, a teacher at the MTC. President Favero invited everyone to pick up an envelope at the back of the hall and write down their address and if possible to add a contribution to the organization. A suggested contribution would be $5.00, but anything would be appreciated. The funds are used to pay for the cost of the missionary reunions and to build up an endowment fund to aid the missionary work in Italy. Also, if you have an Email address, please put it on the envelope so that we can communicate with you by computer which is much less expensive than mailing. It was mentioned that President Grinceri was in town but had meetings that evening and would meet with his missionaries Sunday evening. Two newly called mission presidents to Italy were invited to speak: Pres. Madison Sowell who will be going to Milano, and Pres. Legrand Curtis Jr. who will serve in Padova. Also in attendance were President Vincenzo Conforte, former president of the Catania and Padova missions and currently Patriarch of the Bari Stake, and Pres. Christian Euvrard, former president of the Milano mission who resides in Paris, France. They too were invited to address the congregation. President Sowell spoke to his former students who were in attendance and confessed that he should have given them higher grades. If he could, he would go back and change all of their grades to A plus. He expressed how pleased he was to be able to serve in Italy. He has such respect for his former mission president and the leadership he gave. He bore testimony of a scripture that is found in the Doctrines and Covenants, Section 64:33 which says that out of small things proceedeth that which is great. Each of you, he said, has participated in the small things and planted the seeds that others will now harvest. Over the past twenty years, he has visited Italy and has seen the seeds that were planted and which are now beginning to bear fruit. It is exciting to see the work of the Lord go forth. He bore witness that the Church has been restored through the Prophet Joseph Smith and that this is the work of the Lord. President Curtis expressed his excitement to be called to Padova. As a young man he was called to serve in the Italian mission, and when it was split he was assigned to the north mission. He and President Sowell were contemporaries in the mission and served in the same district and the same apartment. He is looking forward to returning to the mission where he served. He bore his testimony of the gospel of Jesus Christ and encouraged all those present to continue to pray for the Italian saints and the missionaries who serve there. President Conforte decided to speak in Italian because that is the Celestial language. He expressed his gratitude for all of the missionaries who served in the Catania mission where they now have a stake. For him and Sister Conforte, it has been a wonderful experience to be here with you and to continue to serve the Lord. He assumed that we had all heard of the new stake in Puglia and since he was now an old man, they called him to be the patriarch of the new stake. The creation of the stake has brought great joy to him and to the members there. He reminded the missionaries that each of them had helped in the creation of that stake and in the growth of the church in all of Italy. He expressed the feelings of all of the members in southern Italy in telling of their gratitude for all that the missionaries have done in helping to build up the kingdom of God in Italy. He also expressed his appreciation to the mission presidents under whom he served and all that they taught him in how to serve the Lord. He spoke of the priceless gift he has in his personal testimony. It is the most precious possession he has. His brother once told him that he was crazy to dedicate so much time and effort to the Church. He could not make his brother understand that it was because of his testimony of the Savior and of the Prophet, Gordon B. Hinkley. President Euvrard said that he had not known he would be coming to the conference until the last minute, when he was asked to come and assist in the translation of the conference talks into French. Since he is French, he would have nothing to say about Italian being the celestial language. He expressed his gratitude for the many experiences that the church has afforded him over the years. Among those choice experiences is the time he had in Italy getting to know the Italian Saints, some of whom are here tonight. As he helped the Italians gain a testimony of the Gospel, he also was greatly blessed. He spent five years in Italy and still speaks with his hands much to the delight of his French friends. One of the things he learned from the Italian Saints was the ability to love. The French are known as a cold people but the Italians are very loving and he learned much from them. He also expressed his love of the Italian cuisine, the marks of which still show on his body. He was in Rome last November for a conference of all of the Mission Presidents, Stake Presidents, and Area Presidents of Western Europe. Elder Eyring of the Quorum of the Twelve was in attendance and said that while he was in Rome he had a special experience in which he had thought a lot about his fellow apostle, Paul. He felt a strong kinship for this ancient apostle and had a strong feeling that the church would progress in Italy and in all of Europe. President Euvrard said that we are seeing those changes taking place. The members are looking forward to the visit of President Hinkley who will be coming to Europe in the near future. President Euvrard bore testimony that this is the Church of Christ and the work we are engaged in is His work. The work is not always easy and sometimes we get discouraged when things do not go as we would like them to. Progress is being made. We now have three stakes in Italy and soon there will be temples. We may not always see the results of our work but the seeds are sown and the results will come. In closing, President Favero announced that President Anderson, who has been serving as the vice chairman of the organization, was elected chairman and President Parker was elected vice chairman. He also expressed appreciation for Craig Pacini who is the heart of our organization. He spends countless hours working on the Italian Mission Reunion. He is also in charge of finances and if anyone has questions concerning the finances they should speak with Brother Pacini. He also thanked Mike Hendriksen who works with Brother Pacini in organizing the reunions. Next year's reunion will be held at the same place on Friday, April 2,1999 at 7:00 p.m. The closing hymn was Un Fermo Sostegno and the benediction was offered by David Stewart. Watch this site for more news as it is reported. If YOU have news please send it to ima mhpdigital dot com so we can share it with everyone!